There are several ways to start Animation, a tool in the Utilities category. Clicking Preferences opens the Animation preferences. Close dismisses the Animation dialog, and Help opens this manual page in a browser window. Scenes do not include all aspects of Chimera. Scenes increase session file size. Clicking the plus icon in the Scenes section of the the Animation dialog saves the current state of Chimera as a scene and generates a thumbnail image to represent it. Clicking the thumbnail restores the corresponding scene. Scenes can also be saved and restored with the scene command, or restored from Rapid Access. * Deleting a scene also removes its occurrences from the timeline. A keyframe is simply a scene in the context of a timeline. Each keyframe is associated with a preceding transition of one or more display frames. The timeline may also contain actions, or operations in Chimera other than transitions between keyframes. In Animation, a scene or an action can be inserted into the Timeline by drag-and-drop, or a scene can be appended with Add to timeline in its right-click menu. One or more chosen scenes (or similarly, an action chosen by clicking its thumbnail) can be appended to the timeline by clicking the plus icon above the timeline. Giving the first (leftmost) keyframe a duration > 0 frames indicates repeating its contents accordingly, since there is no preceding keyframe to define a transition; this is indicated with a gray rectangle extending from the start of the timeline to the keyframe position. The timeline contents can be played back to preview the movie that would result from recording. Properties that change continuously include: model orientations and scale; clipping plane positions; colors and display states (faded in/out with transparency) of atoms, ribbons, and molecular surfaces; colors, display states, and positions of 2D labels. Discontinuous changes include those in atom/bond styles and volume displays. Transitions between different frames of a trajectory will linearly interpolate the trajectory frame number but use only integer values, thus duplicating or skipping trajectory frames as needed to produce the specified duration. During playback, the target display rate is set to 25 frames per second, to match as closely as possible the speed of the movie that would result from recording with default encoding options (details...). Chimera (default) - Chimera rendering, normally offscreen (details...). Images can be supersampled, that is, initially generated at a higher resolution and then sampled down to the final size. Supersample (1x1/2x2/3x3/4x4) - how many pixels to sample in the X and Y dimensions for each pixel in the final saved image; thus, 1x1 corresponds to no supersampling. Higher values increase the smoothness of edges in saved images and increase calculation time with little effect on file size. 3x3 is generally recommended when supersampling is done. POV-Ray - raytrace with POV-Ray. This rendering option is the slowest but includes fancier effects such as high-quality shadows. The POV-Ray Options button opens the corresponding preferences. Close closes the dialog without initiating recording. Image Tips shows the tips on preparing images, and Help opens this manual page in a browser window. 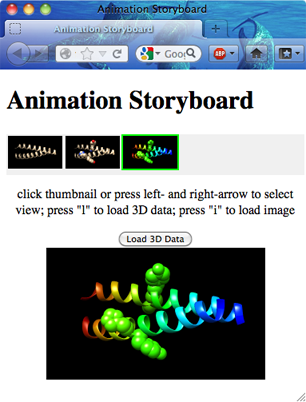 The storyboard can be viewed by opening index.html (which embeds the remaining files) in a browser window. A small example is shown at right. Across the top are thumbnails of the keyframes in the order in which they appear in the timeline, with consecutive keyframes that are the same scene collapsed into a single entry. The central panel shows either the static image or the 3D-manipulable WebGL rendering of a scene. Clicking a thumbnail or navigating the series of thumbnails with the keyboard left and right arrows updates the central panel to the static image of the corresponding scene. Pressing the l (letter ell) key or clicking Load 3D Data loads the corresponding WebGL data into the central panel. When WebGL is shown, the corresponding static image can be obtained again by clicking Load Image, or by clicking in the browser window outside of the central panel and then pressing the i key.